With Memorial Day Weekend right around the corner, if you haven’t made your plans, it’s time to get started. These 20 great getaways offer something for everyone, whether you’re looking for an easily accessible location or something a little more exotic. This time of year in Miami typically means comfortable temps, fewer crowds and discounted hotel rates. The city also happens to throw some of the best beach parties in the country – even Vegas can’t compete with its booze-infused fests, including oceanside celebrations, music extravaganzas and hopping nightclubs. Miami hosts Urban Beach Week, catering to the “Hip Hop Generation,” drawing over 300,000 participants to South Beach for its festivities that take place over memorial day weekend. Not everything is about alcohol though, the city also honors the country’s veterans with the annual March of Colors and a wreath-laying ceremony at Miami Beach Police Headquarters. What better way to spend the long weekend celebrating than reveling in fun festivities and feasting on scrumptious jambalaya? New Orleans offers something for everyone, including families, with attractions like the Aquarium of the Americas, The Insectarium and The Audubon Zoo as well as Greek Fest, when descendants of the city’s earliest Greek settlers commemorate their heritage with a festival celebrating all things pan-Hellenic, including fun, music and Greek food for the whole family. The New Orleans Wine and Food Experience also takes place over Memorial Day Weekend, combining the city’s fabulous cuisine with fine wines. The National World War II Museum not only offers outstanding exhibits, it commemorates the holiday with a performance by the Marine Corps quintet from 10:30 to 11 a.m. Monday. Oregon residents who want to camp have a practically endless number of places to choose from within close proximity, including Honeyman Memorial State Park, just an hour and 20 minutes west of Eugene or three hours southwest of Portland. Here, you can access mountains of sand that extend 40 miles north giving campers plenty of fun hiking opportunities. There are also two freshwater lakes for fishing, swimming, boating, water skiing and windsurfing. While you’re here, the Sea Lion Caves are less than 15 miles north, home to scores of the amusing marine mammals, while Heceta Head Light, one of the most photographed lighthouses on the coast, is just a few minutes further up the road. If you want to go snorkeling without flying all the way to the Caribbean or another tropical locale, Catalina Island is a great choice as one of the few spots in the U.S. where you can do just that. By taking the hour trip via passenger boat service from Long Beach near Los Angeles, you can enjoy clear, clear waters filled with an array of marine life. In fact, Lover’s Cove, is known for having one of the heaviest concentrations of fish found anywhere off the west coast and has even ranked among the top ten best places in the world for snorkeling. Sea stars, eels, anemones, octopi, and Garibaldi fish are just a few of the creatures you’re likely to see. Dolphins and sea lions are also a common sight. The island’s many other activity options include glass bottom boat tours, kayaking, stand up paddle boarding, golf and even casino gambling. There’s a number of reasons to head to the nation’s capital for Memorial Day. Following the tourism boom that accompanies the National Cherry Blossom Festival in April, hotel rates tend to drop quite a bit. Not only that, but temperatures are often ideal – minus the notorious uncomfortable summer humidity, making activities more enjoyable. Just of few of the options include attending the National Memorial Day Parade and memorials at Arlington National Cemetery in addition to the practically endless number of incredible museums and the annual Memorial Day Concert, which will be held on Sunday, May 25 at 8 p.m.
From May through the end of October, Riviera Maya resorts generally offer some really great rates – and over Memorial Day weekend, when many American’s tend to stay a little closer to home, you’ll also compete with fewer tourists for a prime spot of the area’s spectacular white sand beaches. Ecuatours offers special holiday packages for the weekend that includes roundtrip airfare from Miami, three nights at an all-inclusive resort, airport transfers and activities, starting at just $679 per person. San Juan Island, the largest of the San Juan Islands in Washington State, is easily accessible via a scenic ferry ride from Anacortes or a short flight from Seattle. This time of year is still considered the quiet season, with the busier season not officially kicking in until June 15th, which means you’ll have the chance to enjoy a much more tranquil getaway along with lower accommodation rates. At Friday Harbor House, a small inn on a prominent bluff in the town of Friday Harbor, guests enjoy beautiful water views, a fireplace and an oversized Whirlpool bath along with the chance to dine on meals featuring farm-fresh produce and herbs from the inn’s garden. There are a number of farm-to-table restaurants on the island, in addition to great art galleries, museums and boutiques. Rent a kayak and get out on the water, watching for orca whales that are often spotted near Lime Kiln Point and along the entire western shore. You’ll also have a good chance of seeing seals, sea lions, otters, porpoise, bald eagles and more. Friday Harbor’s annual Memorial Day Parade and ceremony, beginning at 10 a.m. on the holiday, is an authentic small town parade that’s also well-worth attending. Cape Cod is easily accessible from many east coast cities, and offers a host of fun things to do. While the water may not be warm enough for a swim, you can always enjoy a stroll down the sand, beach games or visiting some of the region’s lighthouses. If you want to get more active, you might take part the Great Hyannis Road Races on Sunday, May 24, or the guided Botanical Walk at the Harwich Conservation Trust’s Bank Street Bogs Nature Preserve. The High Pointe Inn, overlooking Cape Cod Bay, offers elegance and comfort along with magnificent views and cozily furnished suites with wood-burning fireplaces. You can also indulge on homemade treats that are available throughout the day, including delicious breakfasts, sweet delights in the afternoon and after-dinner nightcaps. With temperatures starting to climb in Arizona, hotel and resort rates begin to dip, allowing travelers to snag some excellent deals for many of its premiere spots over the three-day weekend. And, you can take advantage of the heat by heading to Wet ‘n’ Wild Phoenix’s special “Salute to our Heroes,” featuring a weekend of family fun including firework displays and all-you-can-eat barbecue along with all the exciting water rides. Or, by checking into the Arizona Grand, you can enjoy a few peaceful days of pampering and relaxation with a spa package that includes two treatments and discounts on additional treatments as well as yoga, Pilates and Tai Chi classes, $50 in food credit and late check-out. Like Arizona, in this part of the U.S., swimsuit season is in full swing – and Memorial Day marks the end of bearable temps out in the desert, which means many properties run great specials over the holiday weekend. Here you’ll find nonstop sunshine along with practically an endless number of acclaimed eateries like Copley’s on Palm Canyon, as well as lots of fun vintage shops. This desert oasis with a glamourous past is also an ideal base for exploring the spectacular desert landscape at Joshua Tree National Park, with miles and miles of amazing hiking trails and mountain bike treks as well as being one of the best spots for rock climbing on the planet. You’ll want to stick around town on the holiday, as each Memorial Day the Palm Springs Air Museum hosts the Flower Drop & Air Far, commemorating the important role of those who fought in World War II with a flower drop from its B-25 aircraft. Thousands of white and red carnations represent those who gave the greatest sacrifice for their country. With Memorial Day weekend marking the official start of summer, many New Yorkers clear out of the city, but there are a number of reasons for travelers to head to the Big Apple. Fleet Week, which takes place this year from May 20 to May 26, is an event that offers visitors the chance to tour ships docked in Manhattan and Staten Island, see military demonstrations and meet men and women who are currently serving in the U.S. Navy, Marines and Coast Guard. The Brooklyn Memorial Day Parade is a must for families, with all veterans, regardless of age or war, invited to participate. A tradition in the Bay Ridge neighborhood since 1867, it runs along 3rd Avenue toward Marine Avenue, culminating at John Paul Jones Park for a ceremony honoring those who’ve paid the ultimate price for freedom. The Atlanta Jazz Festival is a great reason to head to this southern city for Memorial Day Weekend. It fills the Piedmont Park area with music on Friday, Saturday and Sunday as the country’s largest free jazz festival, featuring jazz legends as well as up-and-coming jazz greats. Typically drawing some quarter-million attendees, the festival has featured many legendary performers over the years, including Miles Davis and Shirley Horn. Kid-friendly areas are set up throughout the park between noon and 6 p.m., with live music played from 1 p.m. to 11 p.m. In the “Las Vegas of the East” gambling rules as the area’s entertainment, but Atlantic City offers a lot more than that, including a ton of family fun and rides along its iconic Boardwalk. The popular oceanside amusement park, Steel Pier, recently debuted eight new rides, while people come from throughout the country to experience the beaches of Jersey Shore. Wildwoods International Kite Festival, the largest in North America, takes place just outside the city from Friday through Monday, beginning with a beachfront illuminated night kite fly on Rio Grande Avenue. A number of parades and fireworks displays are also featured throughout the area, including the Bradley Beach Memorial Day Parade, Atlantic Highlands Memorial Day Parade and Beach Haven Memorial Day Parade. Fireworks On the Beach take place in Asbury Park on Sunday at dusk. This Texas capital gets some of its best weather around the Memorial Day holiday, with lots of sun and temperatures typically in the 80s. This weekend also kicks off the boating season, giving visitors a great reason to check out Lake Travis or enjoy a swim at Lady Bird Lake, before athletes break out the bikes for a race through the city, leading up to a foot race around the southern part of the lake. With its recent revitalization and growth, you’ll find a little bit of everything in Austin, including more than 193 miles of scenic walking trails, fantastic restaurants and hip cafes, congregated along Sixth Street. Art and music lovers who want to enjoy famous Southern hospitality might want to consider Charleston. One of the first observances of Memorial Day was said to be held here by a group of freed slaves, taking place just weeks after the Civil War ended in 1865 at Hampton Park. Today, known as the world-famous Spoleta Festival, it begins a two-week run over the holiday weekend, filling Charleston’s theaters, churches and outdoor spaces with opera, theater, jazz, symphonies, choruses and visual arts. The Citadel, a nearly 200-year-old military college also offers full-dress parades every Friday afternoon, while various Civil War sites can be seen throughout the city. Of course, visitors can also enjoy rides on its famous horse-drawn carriages and strolling through colorful gardens. Over Memorial Day weekend more than 30 wineries and tasting rooms in the scenic Columbia Gorge area of Oregon, bordering Washington State to the north, feature events like special releases, delicious pairings and barrel tastings. The wineries span the Columbia River Gorge National Scenic Area through 40 miles of tranquil, open roads with magnificent views of Mt. Adams and Mt. Hood. You might consider spending a day in Washington wineries between Underwood and Goldendale followed by a day in Oregon wineries, stretching from Hood River to The Dallas, finishing it up in the Hood River Tasting Rooms. Bermuda is often referred to as a Caribbean island, though it’s actually in the Atlantic, with a location closer to Washington, D.C. and just a two-hour flight from New York City. So what does that mean for holiday travelers? The balmy British isle is just starting its high-season, while many popular tropical destinations are already too hot to handle. Bermuda offers stunning pink sand beaches that stretch for 21 miles along glistening azure waters, including the beautiful pale pink sands at Horseshoe Bay Beach with wonderful secluded coves. You’ll also find world-class spas, fantastic restaurants with outdoor dining on the sand and a variety of accommodation options. Lake Tahoe is a year-round paradise, and offers a ton of fun over the holiday weekend. Catch some free live music on Saturday at the West Shore Café in their new lakeside lounge, and on Sunday, the Mike Brown Memorial Splash In, a family-friendly event, features a beach party and barbecue followed by a Parade of Seaplanes. Some of the area’s most beautiful historic landmarks open up for the weekend, including Vikingsholm Castle and Hellman-Ehrman Mansion. If you’re up for a hike, head to Sugar Pine Point State Park for its scenic hiking trails. If you want to stay at a resort that offers it all, try Resort at Squaw Creek, with four pools, a 120-foot waterslide, and three all-season whirlpools. It also offers a Mountain Buddies program for kids 4 through 12, with a variety of activities, including biking, hiking, tennis, swimming, arts and crafts, games and more. Storybook Mackinac Island, where motorized vehicles are prohibited and folks get around on horse-drawn carriages and bicycles, offers a chance to step back in time and enjoy a myriad of activities. Catch an art show, take a kayak out on the bay, rock out to live bands or just relax to the sounds of the waves as they gently lap the shore. The 1887 Grand Hotel, boasting the longest front porch in the world, is an iconic summer resort offering everything from horseback riding to biking and swimming in its 220-foot pool. Guests can also take advantage of complimentary children’s programs. Camp Wandawega is a unique guest camp on the shores of Lake Wandawega in Elkhorn, Wisconsin that’s been in operation since 1925. There are few better ways to kick off the start of summer than spending the weekend boating, canoeing, fishing or just soaking up the sun on the private beach. Other options include hiking, tennis, biking and shuffleboard. Work up an appetite and then enjoy a cookout under the stars with grills and barbecues available throughout the resort. 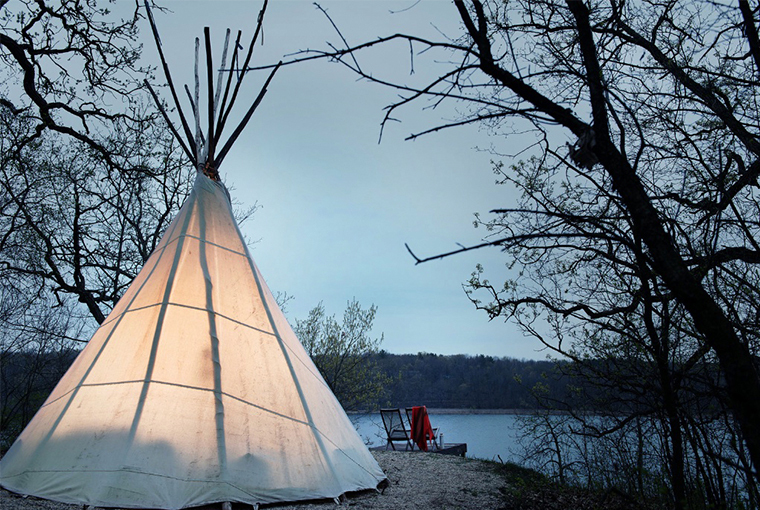 After dark, return to your retreat, ranging from a vintage cabin, bungalow or bunkhouse to a tree house, tepee or tent, allowing you to reconnect with the great outdoors.